1. It was the playing card used by Sir John Dalrymple, the Earl of Stair, to cryptically authorise the Glencoe Massacre. 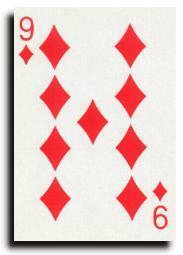 Certainly there is a resemblance between the nine of diamonds and his coat of arms. 2. The Duke of Cumberland is supposed to have scribbled the order for "no quarter" to be given after the Battle of Culloden on a nine of diamonds playing card..
3. It has also been suggested that it is a misreading of the "Corse of Scotland" ie the "Cross of Scotland" or St Andrew's Saltire. There is a resemblance between the pattern of the nine of diamonds and the Saltire. 4. Nine diamonds were at one time stolen from the crown of Scotland and a tax was levied on the Scottish people to pay for them - the tax got the nickname "The Curse of Scotland". The first two explanations are the ones most commonly given.